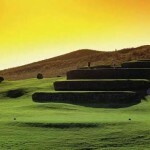 Legend at Arrowhead Golf Club is a traditional tropical style courses with a friendly layout. The fairways pay wide, the rough is generous and the green are large, which makes this a great course for beginning golfers yet challenging enough for the experienced player. Green grass stretches from tee box to green. The fairways are lined with Palm Trees and the bunkers have a downward slope that leads toward the greens. Water comes into play on several holes at the Legend; however, the landing areas are very generous and player friendly. The course is an Arnold Palmer design and is one of the original courses in the Phoenix area to develop. Scenic Fact: Hole #5 at the Legend at Arrowhead offers the famous elevated step-like tees. Stop and enjoy the view before you tee off. Turn RIGHT toward TERMINAL 2/ 3/ WEST EXIT/ 24TH STREET/ DOWNTOWN PHOENIX/ RENTAL CAR RETURN. Turn RIGHT onto E SKY HARBOR BLVD. Stay STRAIGHT to go onto I-10 W.
Merge onto I-17 N via EXIT 143A toward FLAGSTAFF. Take the AZ-101-LOOP W exit, EXIT 214C. Merge onto AZ-101 LOOP W.
Take EXIT 18 toward 67TH AVE.
Stay STRAIGHT to go onto W BEARDSLEY RD. Turn RIGHT onto N 67TH AVE. Turn RIGHT onto W LEGEND BLVD. Terribly maintained golf course. They don’t know the first thing about how to maintain a golf course. They don’t water enough. Huge areas of bare dirt everywhere. Spend you money elsewhere.